According to the new market research report \“Cell Surface Markers Market by Product (Antibody, PCR Array), Source (Mice, Rat), Cell Type (T cells, B cells, NK cell), Application (Research (Stem Cell, Immunology), Clinical (Oncology, Hematology)), and End User (Hospitals) – Global Forecast to 2023\“, published by MarketsandMarkets, analyzes and studies the major market drivers, restraints/challenges, and opportunities in North America, Europe, Asia-Pacific, and the Rest of the world (RoW). Dont miss out on business opportunities in Cell Surface Markers Market. Based on antibodies by source, the cell surface markers market is segmented into mice, rats, and other sources. In 2018, the mice segment is expected to account for the largest share of the cell surface markers market. This segment is also expected to grow at the highest CAGR during the forecast period primarily due to the cost-effectiveness offered by mice models as a source of antibody production. Based on end user, the cell surface markers market is segmented into academic & research institutes, hospitals & clinical testing laboratories, and pharmaceutical & biotechnology companies. 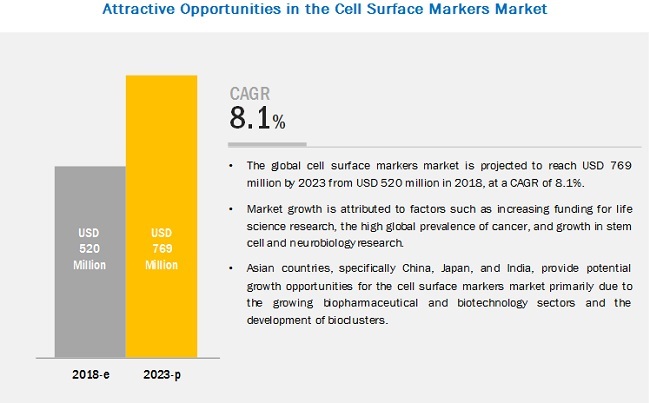 In 2018, the academic & research institutes segment is expected to account for the largest share of the cell surface markers market. The growing use of cell surface markers in cancer, stem cell, and HIV research; increasing number of cancer and stem cell research projects across the globe; and the rising public-private funding for cell surface marker-based research are the major factors driving the growth of this end-user segment.